A significant contemporary phenomenon in the field of cartography and geographic information science is the emergence of map-based geocrowdsourcing. This phenomenon has changed the fundamental data collection strategies for many traditional geographic data producers, and has changed the way society participates in the collection and use of geospatial data. A short review of this phenomenon is followed with an introduction to a multi-year geocrowdsourcing study at George Mason University, which explored the significant aspects of field-based data collection, transient event characterization, and quality assessment for crowdsourced geospatial data. 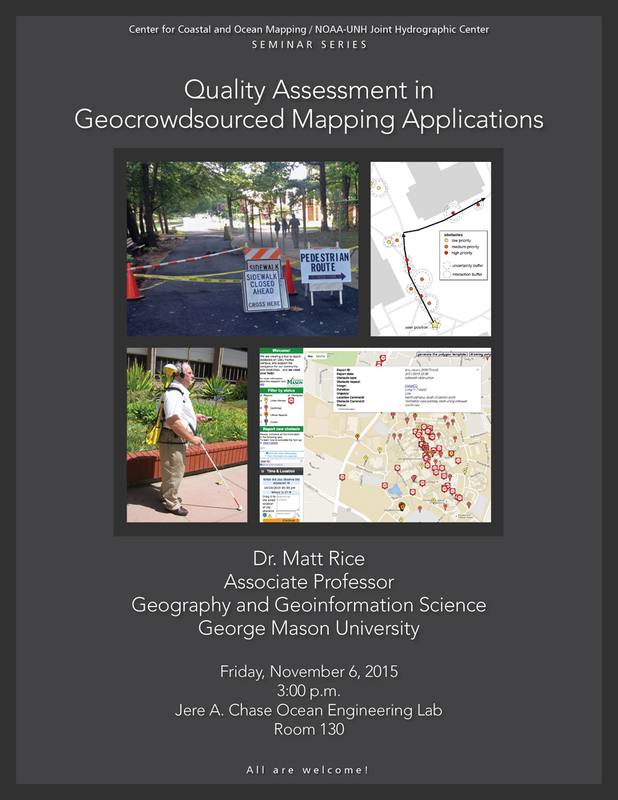 Dr. Matt Rice is an Associate Professor in the Department of Geography and Geoinformation Science at George Mason University. He completed a Ph.D. at UC Santa Barbara (2005) and a two-year Intelligence Community Postdoctoral Fellowship at the National Center for Geographic Information Science. Dr. Rice directs one of the largest Masters of Science Program in Geographic and Cartographic Sciences in the nation and advises a large contingent of undergraduates, masters, and Ph.D. students in topics ranging from traditional cartography and geographic information systems to digital humanities, accessibility analysis, and digital gazetteer research. Dr. Rice has served as the Vice-Chair, Chair, and Past Chair of the Association of American Geographers Cartography Specialty Group, and is the current Vice-President of the Cartography and Geographic Information Society. His research has been published in CaGIS, Transactions in GIS, The Professional Geographer, GeoJournal, Cartographica, and Computers and Geosciences.